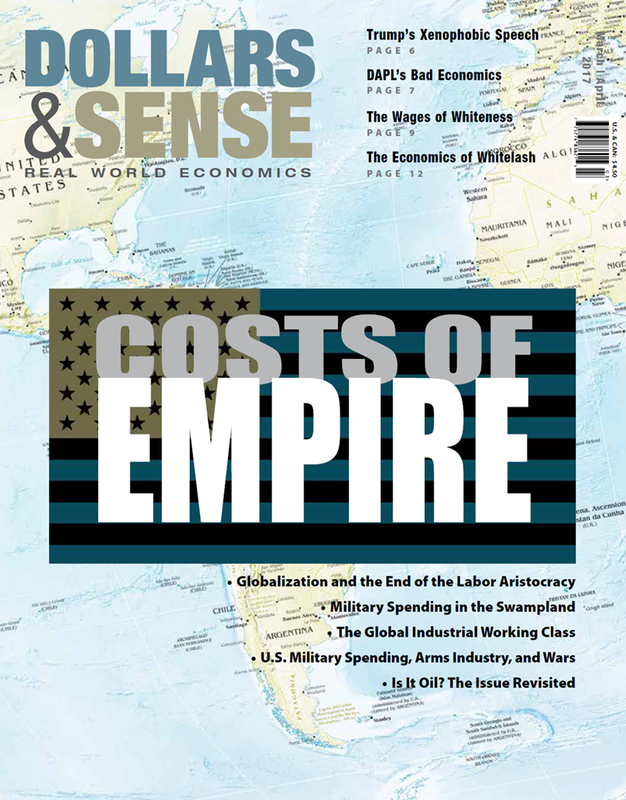 This is our special “Costs of Empire” issue (though we are covering the theme throughout 2017). At one time or another, almost the entire world has been colonized by one European power or another. By the early 20th century, the British empire alone ruled nearly one fourth of the world’s people. The map of the world, however, is no longer a mosaic of European colonial possessions. Most of the Americas became formally independent in the late 18th or early 19th centuries; most of Asia and Africa, in the mid to late 20th century. Formal colonial empires—characterized by the direct political and military control of the colonial powers—gave way to informal empire over much of the world. Britain became the dominant power in South America in the 19th century without recolonizing the entire region. The United States supplanted Britain and Spain as the dominant power in Central America and the Caribbean in the late 19th and early 20th centuries, with only some former colonies of European powers becoming formal colonies of the United States. By mid 20th century, the United States had eclipsed Britain as the dominant power in the capitalist world. The United States ruled its informal empire through a combination of military, political, and economic power. It plied local elites with promises of a cut of the riches extracted from the “open veins,” to use the words of Uruguayan essayist Eduardo Galeano, of the dominated lands and peoples. It maintained a system of client governments reliable in their suppression of revolutionary political movements and maintenance of profitable conditions for U.S. companies. And it asserted the right to intervene militarily in other countries—first within its “sphere of influence” (or, even more demeaningly, “backyard”) of Latin America, and then across the world. In her article “Globalization and the End of the Labor Aristocracy,” economist Jayati Ghosh argues that imperialism has not disappeared, but changed shape. The direct military conquest and control of economic territory by the great powers has given way (at least some of the time) to control through multilateral agreements and international institutions. Economic territory may still mean the seizure of land, mines, or oil fields—but it also may mean privatization of public assets and services, or the extension of intellectual property rights to new realms. Where the “labor aristocracy” of the imperialist countries once shared in the bounty of empire, the new incarnation of empire as “globalization” has helped grind away the incomes and status they once enjoyed. Lest anyone think that the old hallmarks of dollar-gunboat diplomacy are now ancient history, Arthur MacEwan revisits a perennial question of U.S. foreign policy—“Is It Oil?” MacEwan earlier addressed the question in the May/June 2003 issue of Dollars & Sense, in the wake of the U.S. invasion of Iraq (beginning the Second Iraq War). Today, he looks at the outcomes of the war in terms of control of Iraq’s oil reserves (especially timely given Trump’s statement, when speaking to the CIA in late January, that the U.S. should have kept Iraq’s oil and “maybe we’ll have another chance”). MacEwan emphasizes—contrary to “conventional wisdom,” even among progressive critics of U.S. foreign policy—that the primary concern is not securing oil resources essential to American’s energy-hungry lifestyles, but rather securing control of those resources and profit for giant U.S.-based oil interests. Immanuel Ness shows us the opposite side of the equation. As capitalism penetrates every corner of the world, it not only extracts profit but also expands the realm of capitalist relations of production—and with it the growth of the working class. While “first world” workers have suffered mightily under conditions of deindustrialization, and are still struggling to rebuild their capacity for struggle, “third world” workers are suffering under conditions of subordinate industrialization and are, in various places, rising up with new strength—as the formation of industrial unions and eruption of strike waves testifies. An empire may have an impressive head of gold—but mind what its feet are made of.